A derny is small motorbike that is used in track and road racing to pace cyclists up to high speeds, usually driven by a larger fellow for more effective drafting of the rider behind. Though you won’t see derny’s in tons of races today the popular Kieren race use them to bring up the group of riders up to set pace and then rides up the bank to allow a final sprint to ensue. If you’re lucky enough to live in a European city that hosts an upcoming six-day race event you’ll be able to catch some derny paced track races in person. 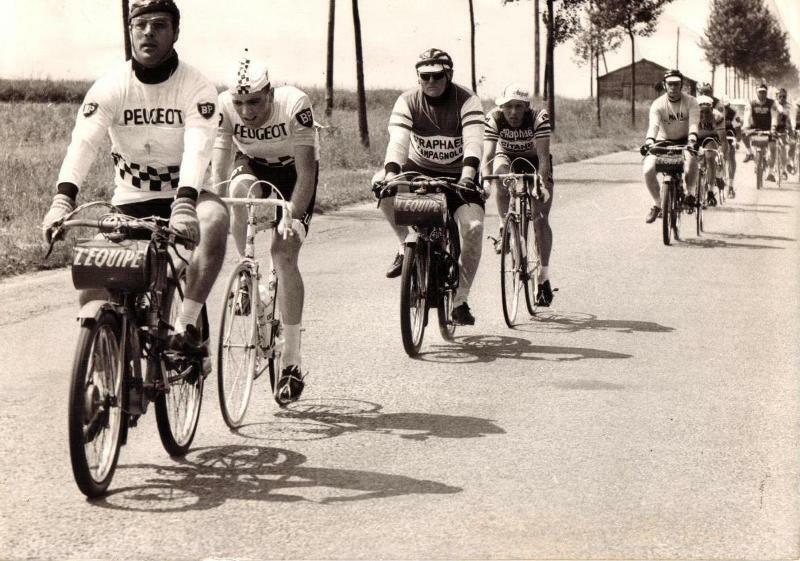 Pictured: some earlier bulky pacing bikes used on velodromes and more streamlined versions with handlebar mounted gas tanks in use on the Bordeaux-Paris. Until I read the bottom piece I was thinking to myself “Oh how far we have come.” Now it all makes sense though. Pretty interesting. Finally, a job I am built for. Where do I sign up?